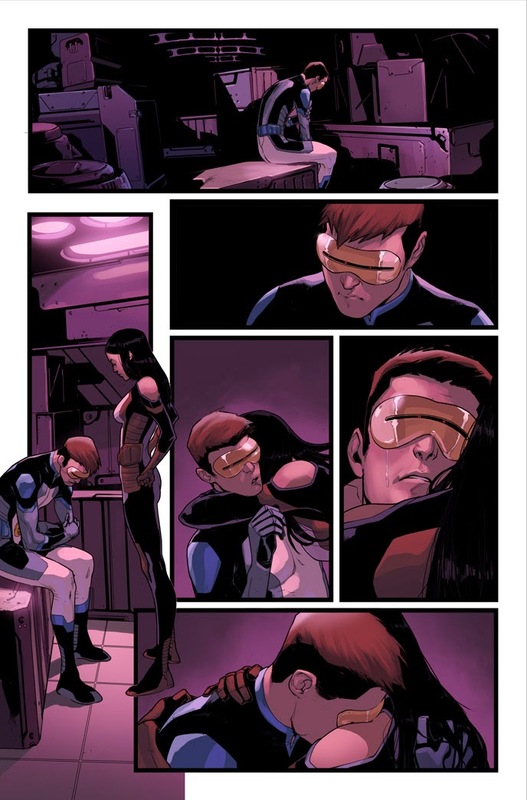 Marvel is pleased to present your first look at GUARDIANS OF THE GALAXY #12, from the rock star creative team of Brian Michael Bendis and Sara Pichelli! 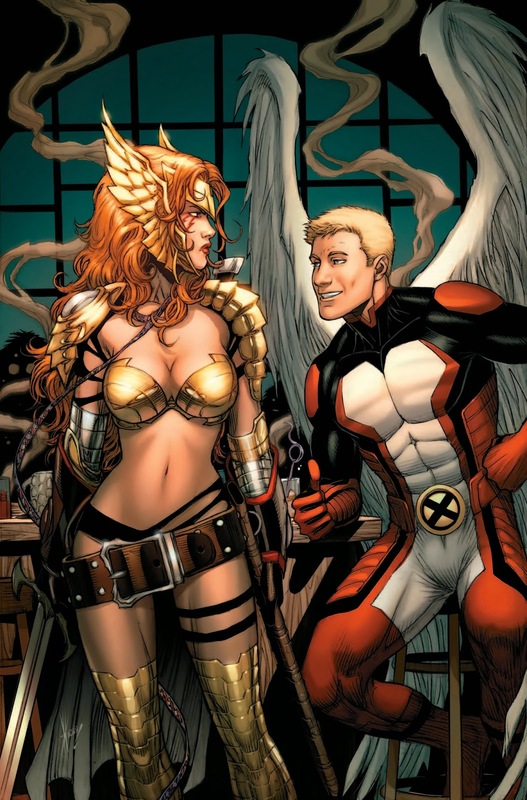 Jean Grey has been abducted by the Shi’ar Empire – accused of cataclysmic crimes she has yet to commit. But not all is as it seems. 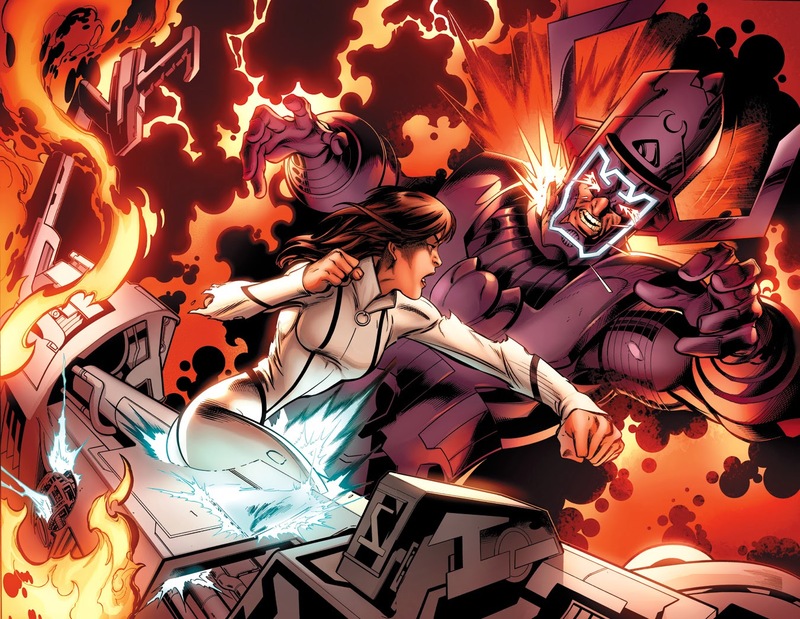 How are Star-Lord’s malevolent father and the Spartax Empire involved? 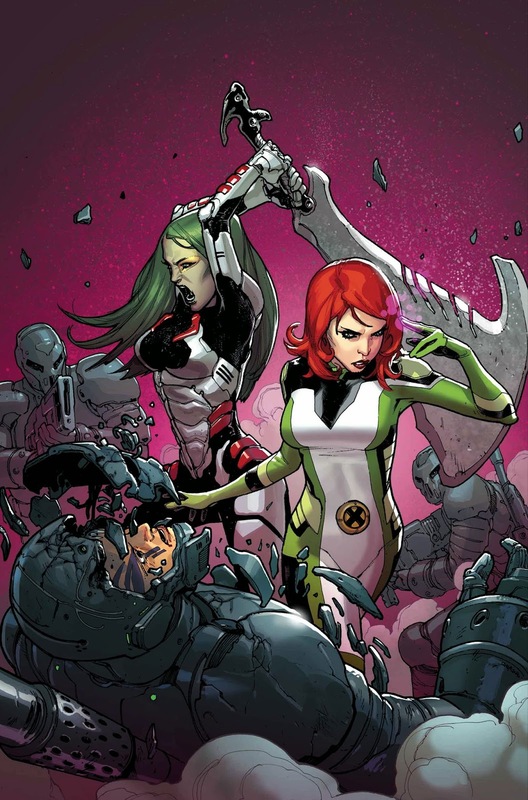 Now, as the Guardians of the Galaxy and the All-New X-Men race to the edge of the deep space to rescue her – they’ll enlist the help of some very unlikely allies. 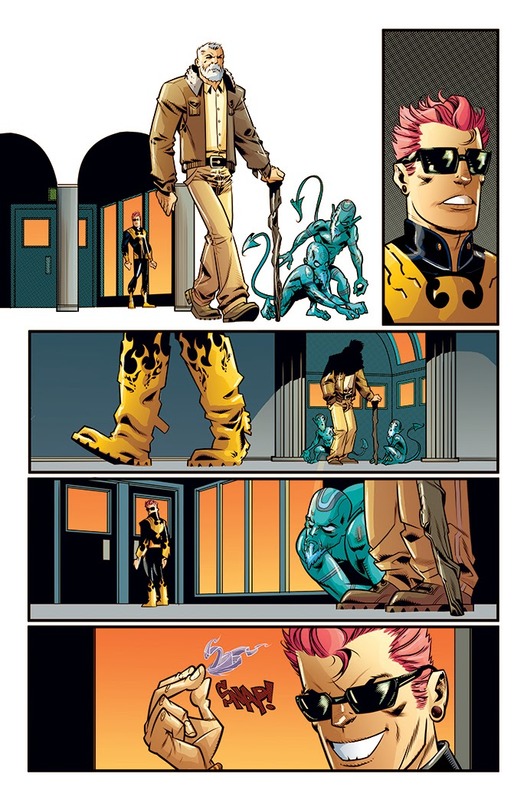 One of whom will have world shattering consequences for one of the All-New X-Men! But even they may not be enough to stop the most powerful army in the Universe. 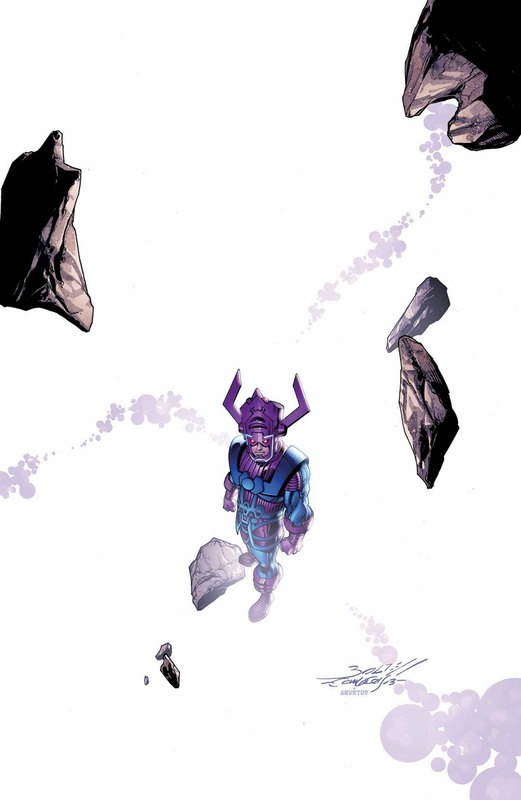 Don’t miss the encounter that will have everyone buzzing today in GUARDIANS OF THE GALAXY #12! 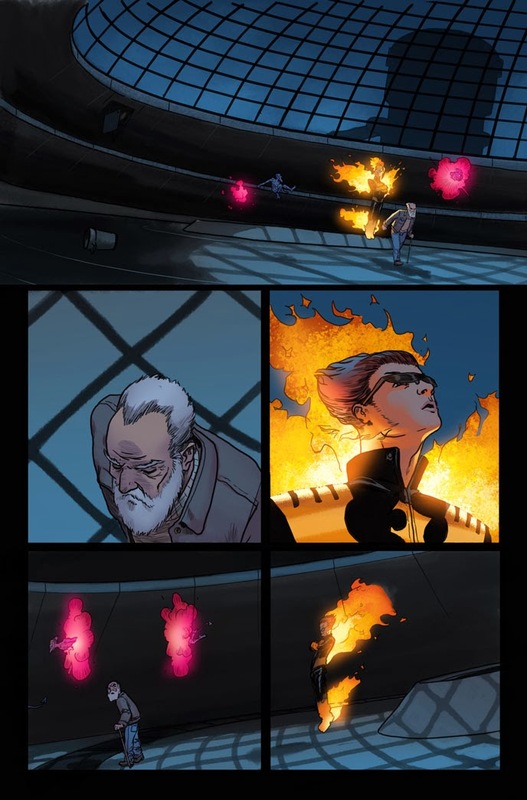 Blockbuster writer Kieron Gillen and rock star artist Adam Kubert peel back another layer in Wolverine’s shadowy past – and today, Marvel is pleased to present your first look at ORIGIN II #3! 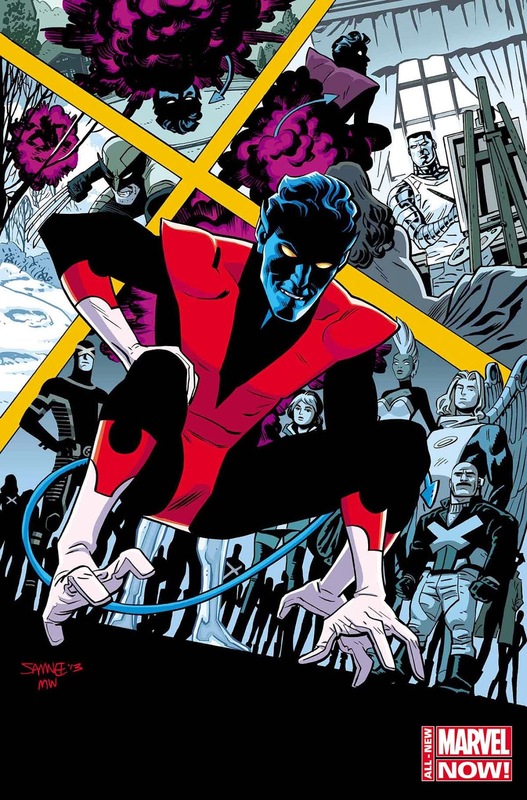 Witness the very first meeting of the mysterious mutant and the man who would become one of his greatest enemies – the malevolent Mr. Sinister! 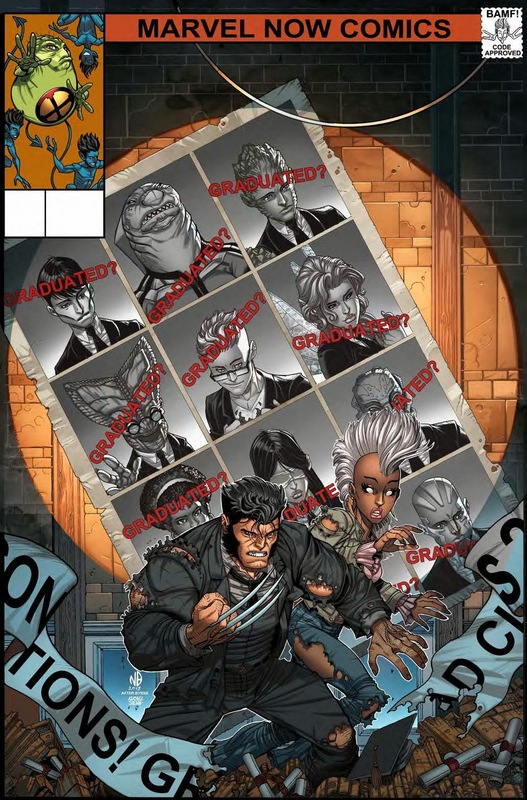 Broken and savage, the clawed mutant has been pulled back into the world of civilization – by force! 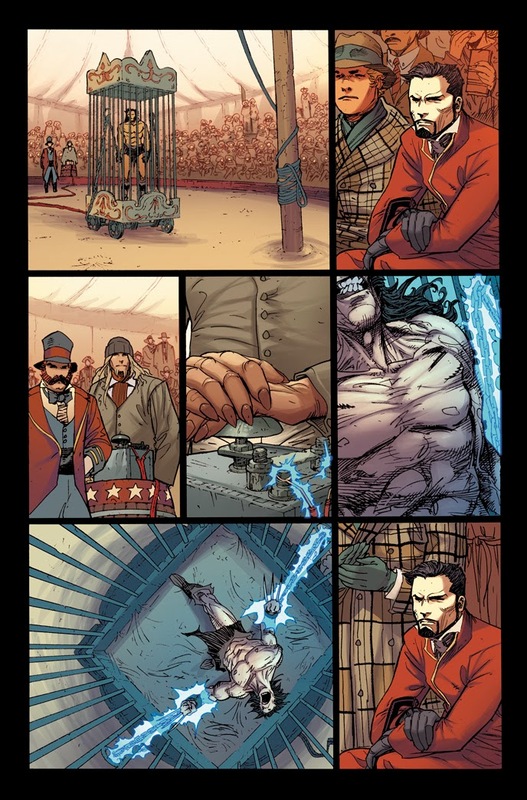 Brutally beaten and held captive, the ferocious first “X-Man” is forcibly experimented on by Nathaniel Essex and his Marauders. And the only man who can save him is…Creed?! But amid the horrors visited upon him, James Howlett may find the one thing he thought lost forever – his humanity. 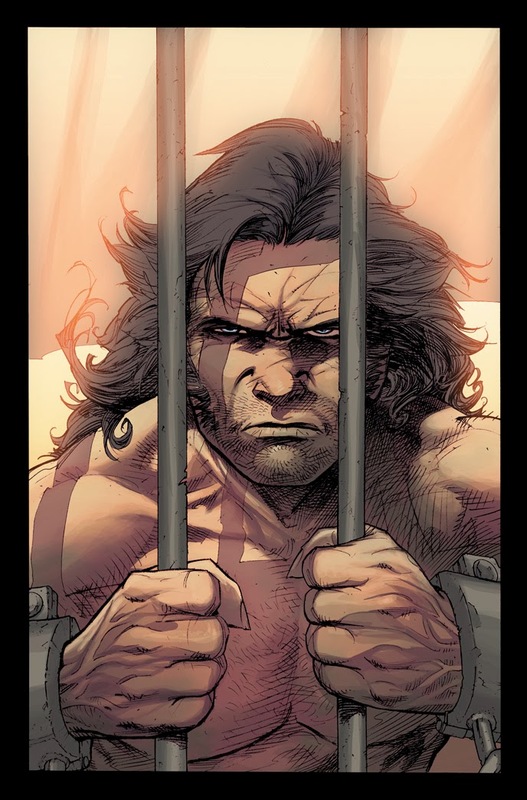 At some point the Wolverine must choose: is he man or beast? 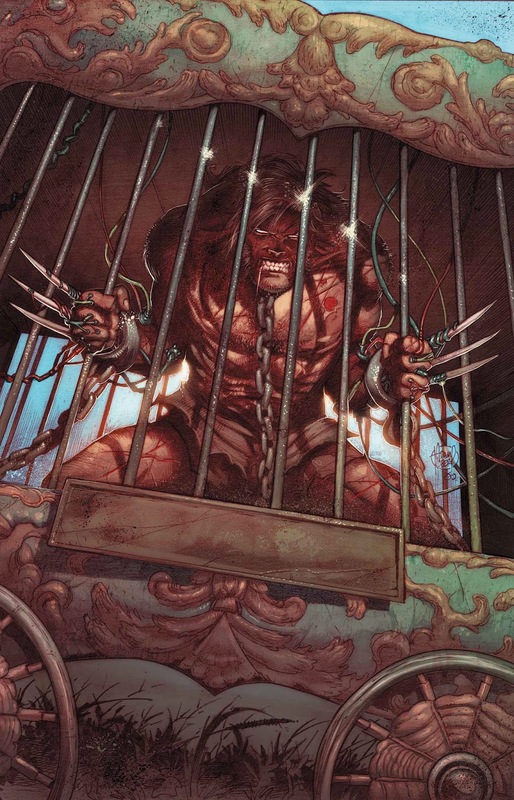 What shocking revelations lie in the untold story of Wolverine’s past? 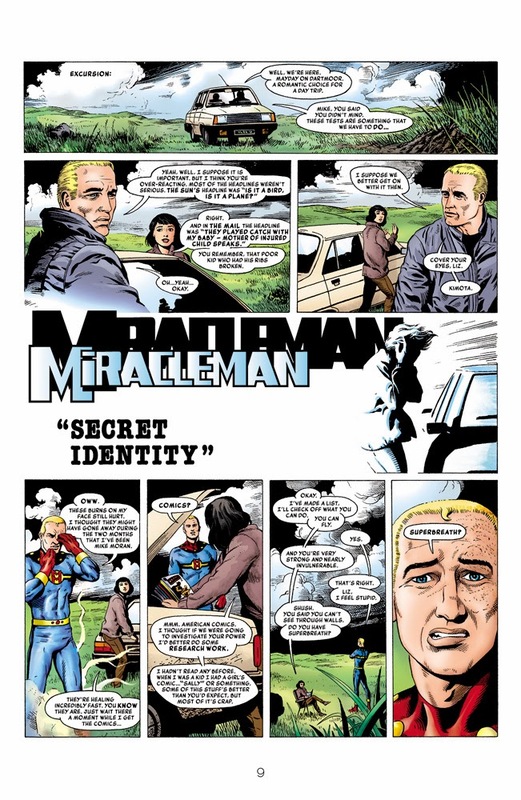 It’s the story everyone is talking about – and today, Marvel is proud to present your first look at the newly remastered MIRACLEMAN #3! 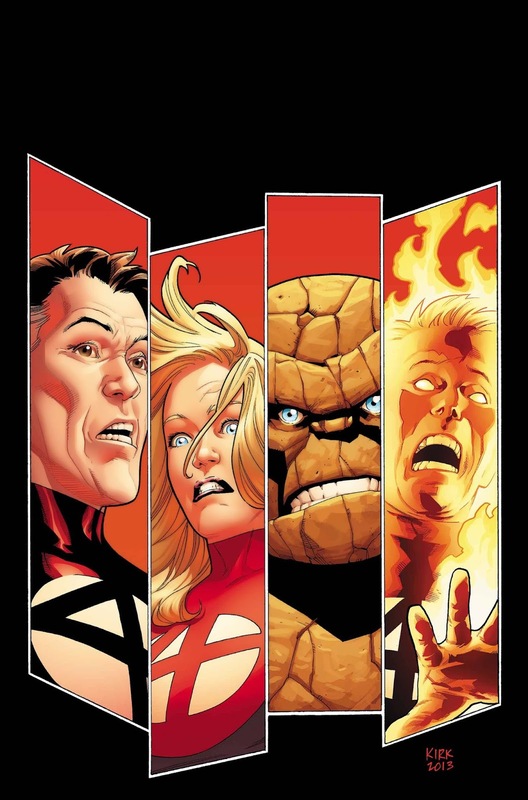 The series that changed comics forever has finally returned to comic shops – and now is your chance to experience these stories like never before! The mystery is solved! 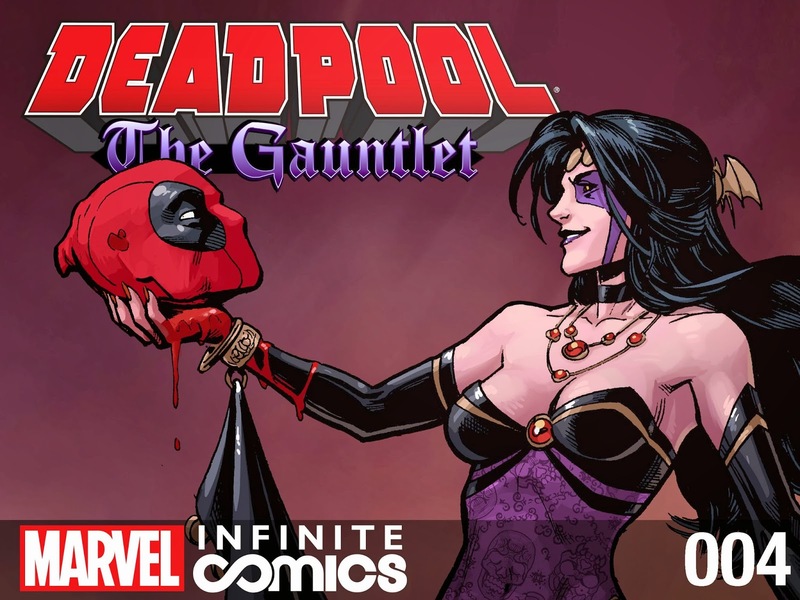 And the blushing bride to be makes her grand entrance today in Deadpool: The Gauntlet #4! Bet you she’s not what you expected! 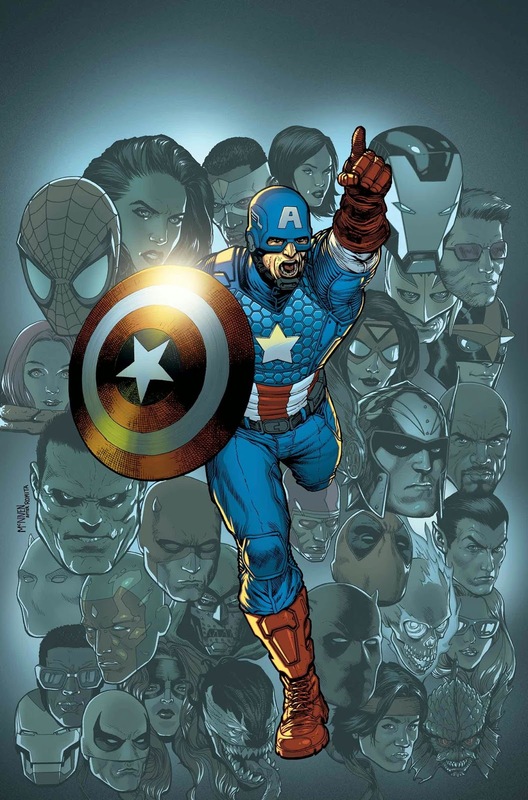 The smash hit weekly Infinite Comic series continues today – and you don’t miss the issue everyone will be talking about! That mysterious package Deadpool was delivering? It’s not a what – but a who! Long dormant, the dark and mysterious Shiklah has been released upon the Marvel Universe! And though there may be wedding bells in her future with Wade, she’s already betrothed to another – Dracula, Lord of Vampires! And he’s not interested in sharing! 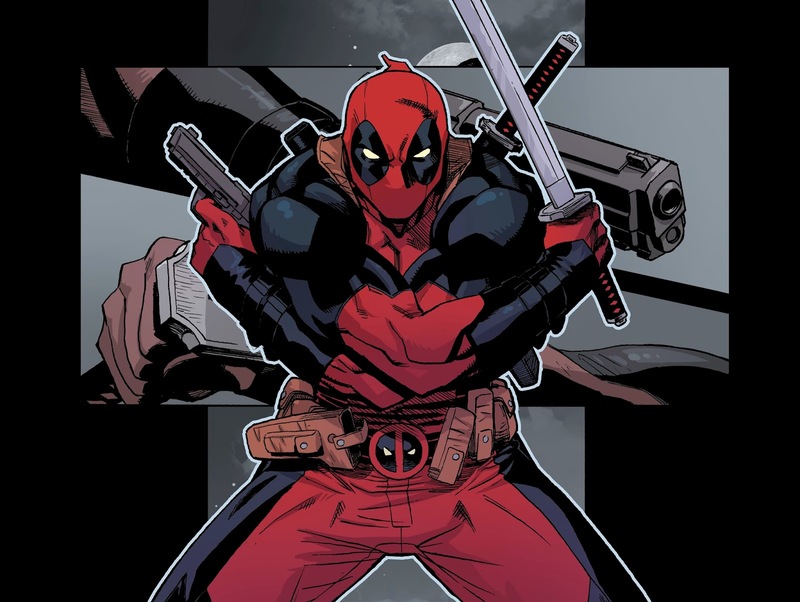 But before the soon-to-be-married Merc with a Mouth can get his head on straight – he’ll need to survive a run in with the one and only Blade! And the world famous vampire hunter has got a thing or two to say about Wade working with Dracula. Don’t miss the digital Deadpool adventure that will have everyone talking with Deadpool: The Gauntlet #4 – available today! Released in early 2013, the gritty reboot of "Tomb Raider" became adored by many. Square Enix decided the new Lara Croft deserved the next-gen treatment, and it is now out on the PS4 and Xbox One. Titled "Tomb Raider: Definitive Edition," this game should be held to high standards. Playing on the PS4 version, it definitely meets them. It has no problem hitting the 60 frames-per-second benchmark, although there are dips in the more action-packed sequences (the Xbox One version was not tested). Despite that, everything moves very smoothly. 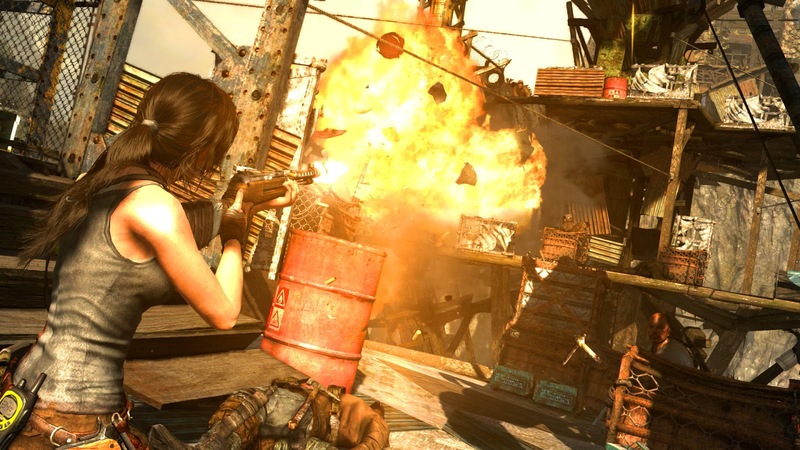 It's a very beautiful game, and the folks at Crystal Dynamics did an amazing job overhauling the lush, vibrant world to make it feel very real, thanks to TressFX technology. Foliage reacts appropriately to the wind and Lara's movements. 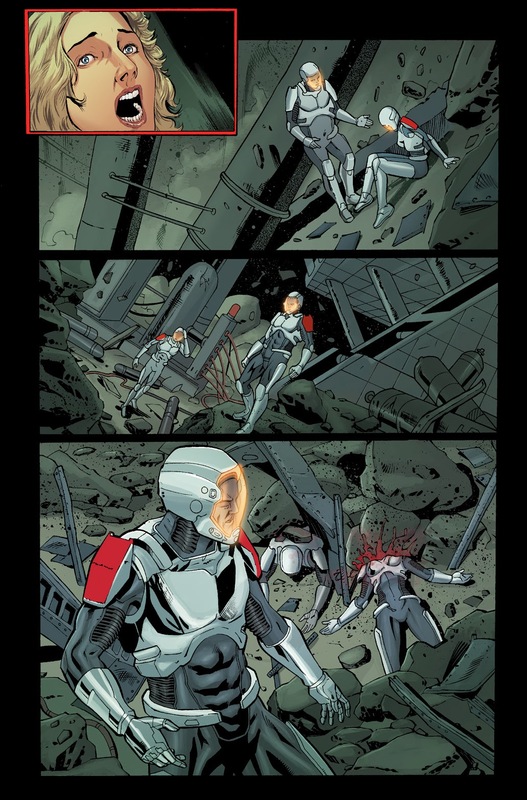 The lighting effects dazzle the eyes, and the attention to detail like blood, mud and sweat on characters is superb. Gameplay is basically the same as before. 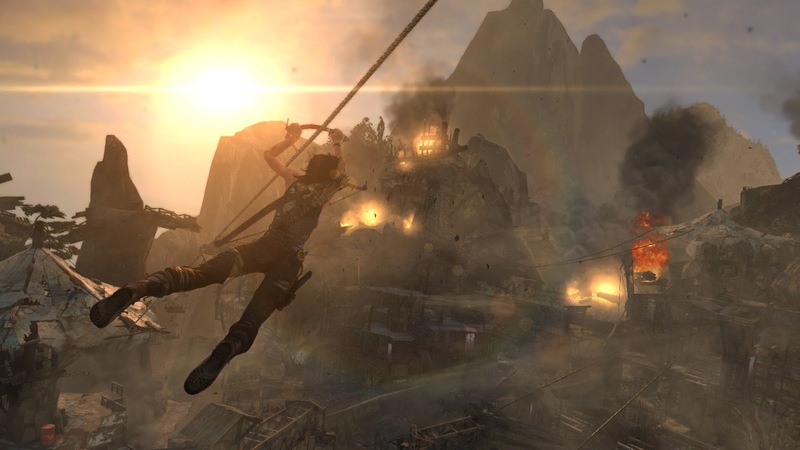 Inspired by Naughty Dog's "Uncharted" series, players will have Lara jumping large gaps, dangling along edges, and brutally dispatching enemies who get in her way. This mostly linear game encourages exploration in more open sections to collect salvage and find hidden artifacts to gain skill points and upgrade abilities and weapons. Unfortunately, there aren't many tombs to raid, which were a highlight of the classic games. The puzzles aren't difficult either. I kind of wished they focused more on this aspect of Tomb Raider than the multiplayer mode that feels tacked on without any thought. The story holds its own to the very end, even if the narrative in the beginning doesn't mesh well with Lara's actions. 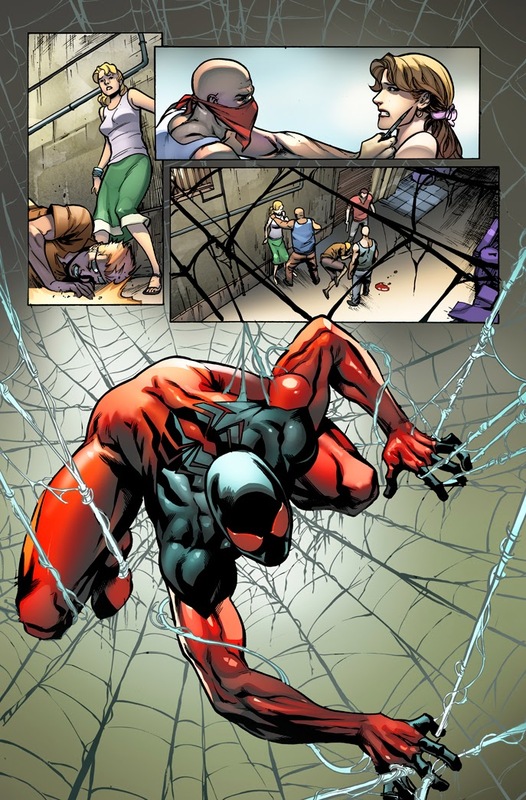 She's scared like no other after being captured, and is very distraught after killing a person for the first time. But afterward, you're brutally killing enemies left and right with ease, so those early traumas become lost in no time. The "Definitive Edition" also comes with the game's DLC including an optional tomb to raid, alternate costumes, and some multiplayer elements if you're one of the few who enjoys this mode of play. Other additions are minor, like voice controls if you feel like shouting at the TV instead of using buttons. 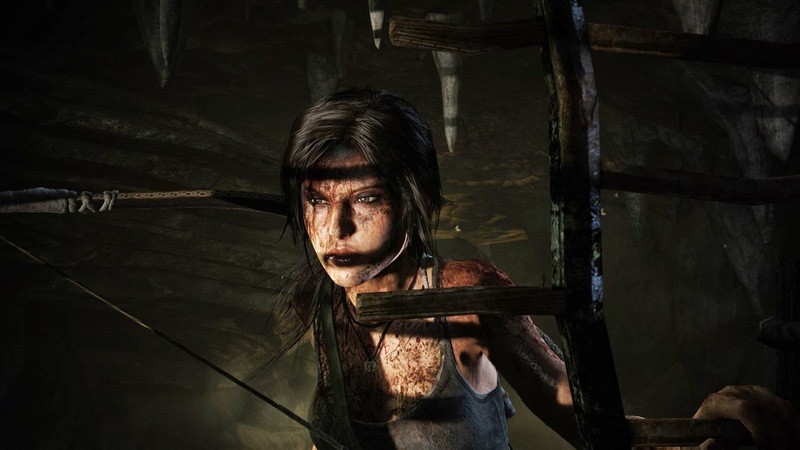 Recovered artifacts can be rotated onscreen using the PS4 controller's touchpad, and the light bar flickers different colors like red and orange if Lara's holding a torch. It's a neat effect that caught me by surprise. Here's the big question about "Tomb Raider: Definitive Edition": Is it worth the full retail price of $59.99? Yes and no. It's not worth it to those who've already played the game on last-gen consoles and PC in 2013 since it's essentially a more beautiful version of this game. However, it's still an excellent reboot, and those who missed out the first time -- and are dying to play something on the brand-new consoles -- should treat themselves to one of the top games of 2013. A downloadable code for the PS4 version of "Tomb Raider: Definitive Edition" was supplied by the publisher for this review. Post originally written by Jeff Hoard for Digital First Media, reprinted with permission. “Inconspicuous Love,” a new book by Teresa Stegall, has been released by Dorrance Publishing Co., Inc. It can be seen in the way a mother holds her baby, in the flowers a lover gives, in the touch of a man to his lady, and in the silent tears shed for a special friend, but more often than not, love is more than what the naked eyes can see. Seeing through the subtle core of what love is, Inconspicuous Love unravels a story so tangible that every reader can relate to. This book is more than your typical-love-story, which tackles both the pleasures and the horrors of being in love. Entertaining and informative, Teresa Stegall presents fresh ideas that are fitting for our times. Being a firm believer of the Lord and in the power of prayer, Teresa Stegall aims to share to the world that life’s complications can be solved with a sincere heart and strong faith. She is deeply involved in charity works and has varied interests, such as skydiving, boating, fishing, and dancing. “Inconspicuous Love” is a 72-page paperback with a retail price of $16.00. 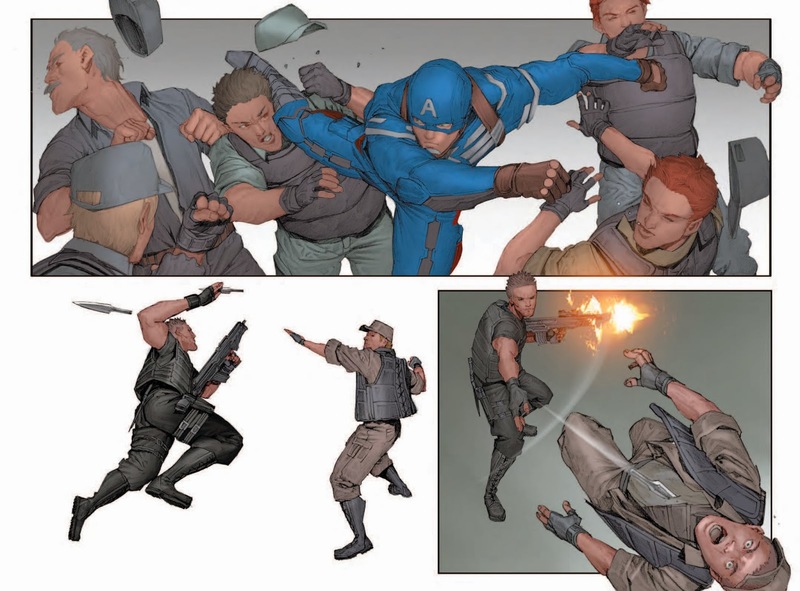 Journey into the world of the upcoming summer blockbusterCaptain America: The Winter Solider with an all-new Infinite Comic prelude from legendary writer Peter David (All-New X-Factor, The Incredible Hulk) and rising star artist Rock-He Kim (X-Force, Infinity: Against the Tide)! meets the eye? 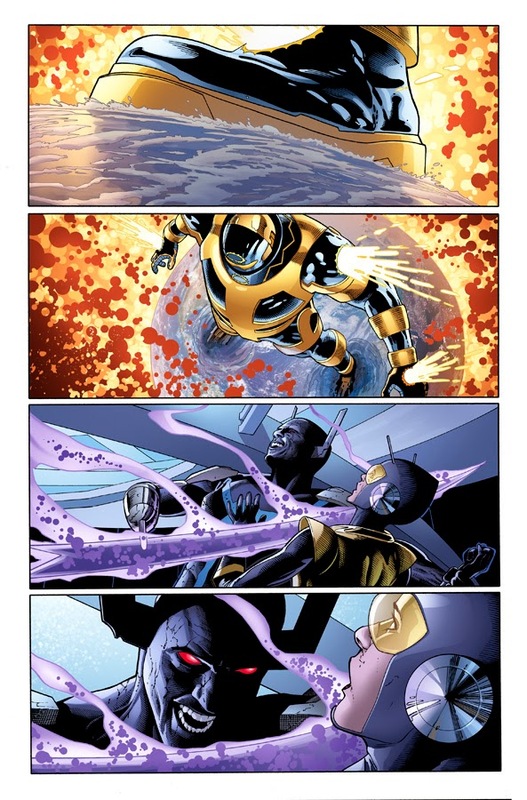 What secrets is S.H.I.E.L.D. keeping? Are there enemies on both sides? 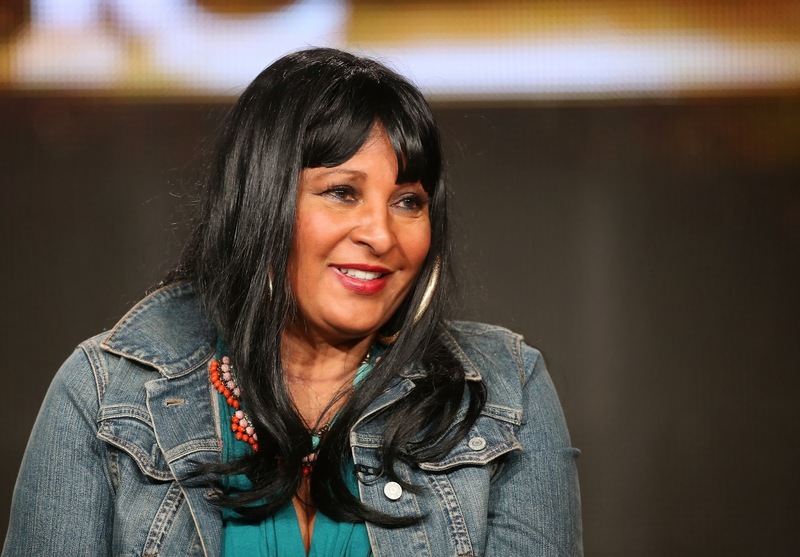 Pam Grier was never one to turn the other cheek; however, she might turn yours. Then again, one could expect no less from arguably cinema’s first female action hero, who is best known for 1972’s “The Big Bird Cage” (produced by B-movie king/Detroit native Roger Corman), 1973’s “Coffy” and 1974’s “Foxy Brown”— all Blaxploitation films. “There were quite a few black males that had done work in this genre before me, but as soon as I stepped into the men’s shoes, it became exploitation. This was from the conservative moment that didn’t want me out of the kitchen, and wanted me barefoot and pregnant and wifey. When that happened, they called it ‘Blaxploitation,’” said Grier, 64, of Colorado. Grier will appear at the Redford Theatre in Detroit for its Pam Grier Film Festival Friday and Saturday (see sidebar). Although she’s been to Detroit before, she’s never been to the Redford and looks forward to it. Her career experienced a revitalization in 1997 when director Quentin Tarantino cast Grier in the titular role of “Jackie Brown,” an homage to her Blaxploitation roles and based on late Michigan author Elmore Leonard’s novel “Rum Punch.” Grier earned numerous award nominations for “Jackie Brown,” including a Golden Globe. 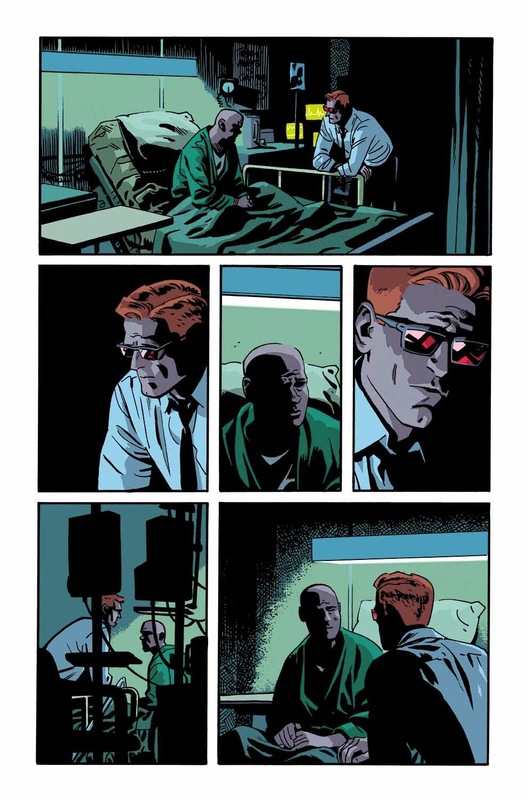 “I absolutely adore Quentin. He’s incredible… He’s very observant and what he always says, I try to do better. When people do that for you, that’s the greatest gift. If I never worked again, it was the pinnacle to work with (Quentin),” said Grier. From 2004-09, Grier appeared as Kit Porter on Showtime’s “The L Word” — a drama about lesbians and their circle of friends in West Hollywood — where she was nominated for the NAACP Image Award for Outstanding Supporting Actress in a Drama Series. “I had to do ‘The L Word’ because I had no idea the discriminatory practices against the gay community. I didn’t know they couldn’t get benefits, insurance, or have children. You just assume that everyone is equal — and that’s not true,” she said. “I loved that character. I loved PLAYING her! The universe sent that role to me. 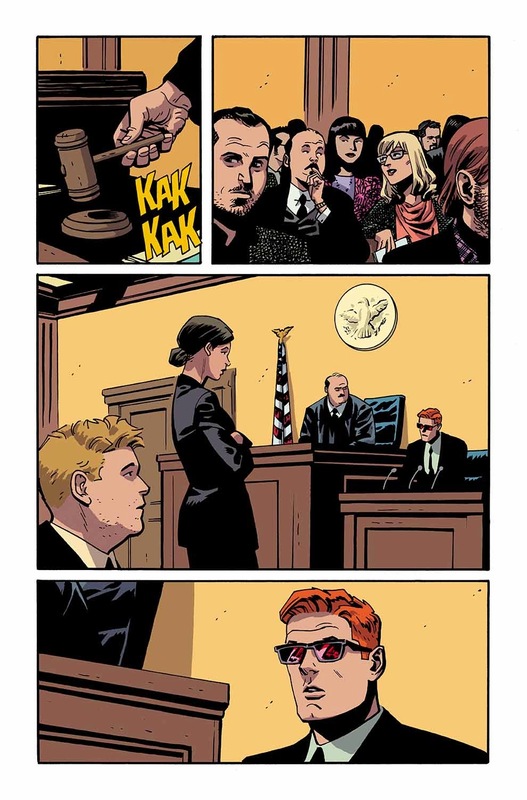 I didn’t have to look for it and I’m like, ‘Amanda Waller? Are you kidding me? I’ll do it!’” she recalled. Grier is currently filming the TV series “Black Hawk,” which is slated to air in late 2014. “Think ‘Homeland’ and ‘Strikeback’ with a little flavah, a little spice,” described Grier. Grier’s as tough as her characters — she’s had to be. She’s been attacked three times in her life — as early as 6 when she was raped by two boys — and was diagnosed with cancer in 1988, where she was given 18 months to live. “Either I victimize myself or come out the other side. I won’t let it knock me down. It didn’t kill me. There are scares, but I’ve learned from it and I can share that with others,” she said. Written by Kurt Krug for Digital First Media, reprinted with permission. While Gail Simone's Red Sonja series is scorching hot, Dynamite is presenting a Red Sonja one-shot done as a manga style book! 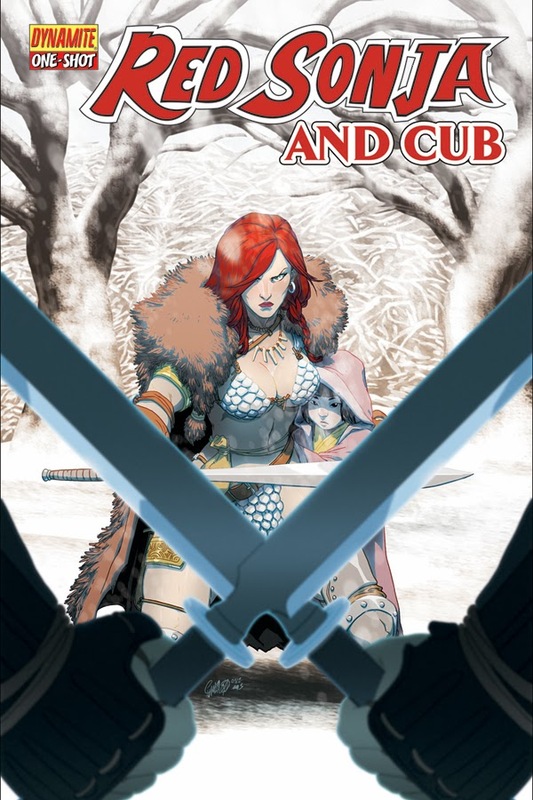 In April of 2014, Red Sonja and Cub will be offered, written by Jim Zub (Pathfinder), drawn by Jonathan Lau, with a cover by Jeffery "Chamba" Cruz! 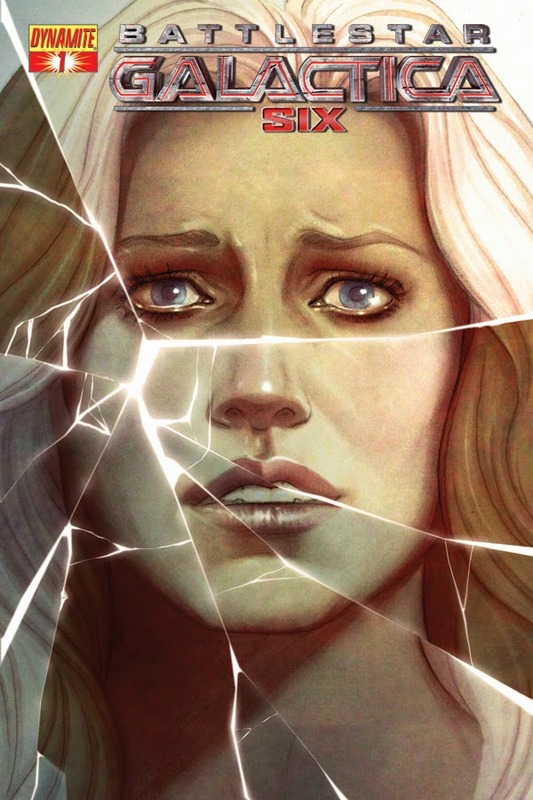 This oversized issue will be available in April from Dynamite Entertainment in comic stores and digital. From the Eisner and Harvey award-winning, New York Times bestselling famous cartoonists Art Baltazar and Franco comes the crossover epic event of a lifetime! Finally, Captain Action Cat meets Action Cat and the characters from Aw Yeah Comics! 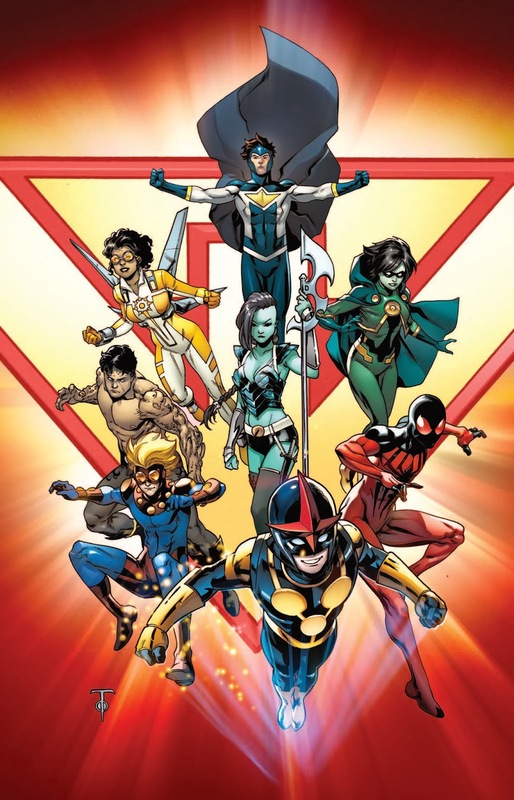 Also crossing over with Dark Horse Comics characters such as Ghost, X, Captain Midnight, and The Occultist, this series promises the typical zaniness that the creators of Tiny Titans are known for. True story! In Captain Action Cat: The Timestream CATastrophe #1, there is something evil out there and Evil Cat is determined to find it... even if it means searching throughout the Silver Age to do it! Could this blip on the screen be the one known as Doctor Evil Cat? 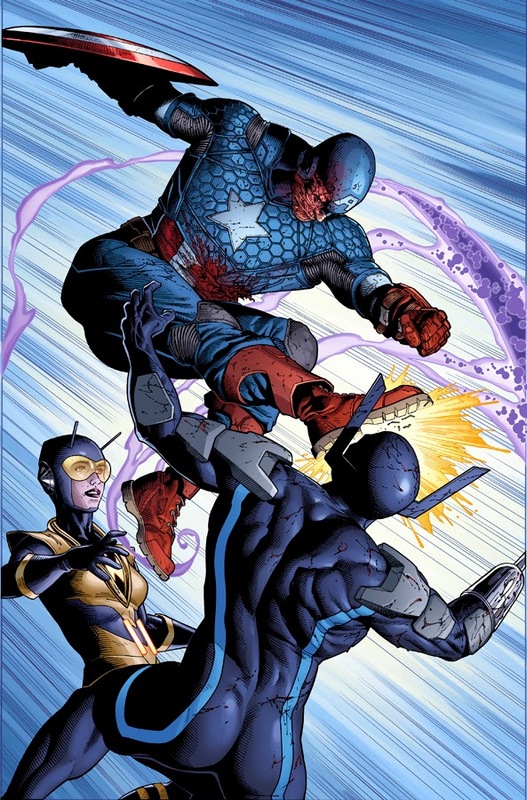 What will happen when the Silver Age and the "Aw Yeah Age" collide! What does this mean to the timestream? 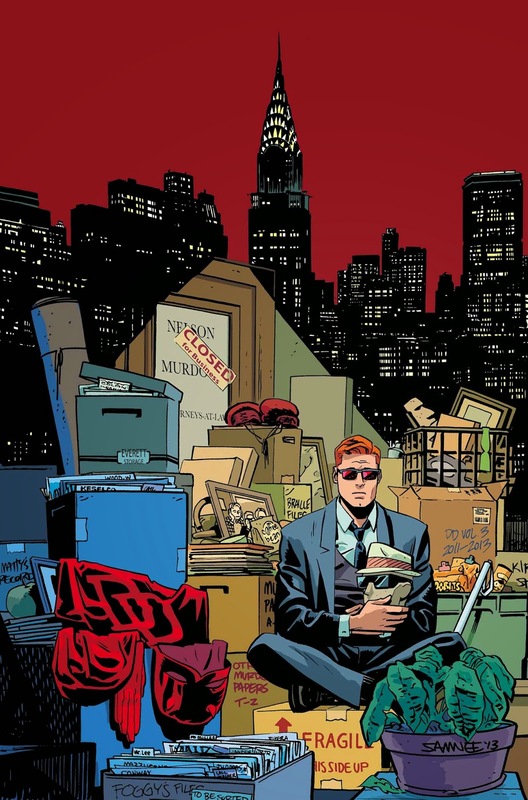 The fate of the comic world may change forever! Plus, a mysterious frozen souvenir from the Golden Age makes a visit! 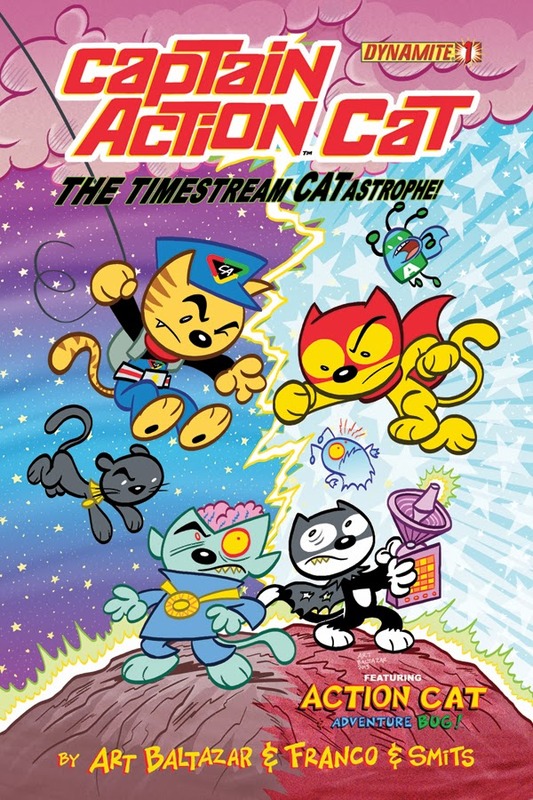 For the first time ever, The Timestream CATastrophe introduces Captain Action Cat, an anthropomorphic action hero based on the classic action figure / adventure toy,Captain Action! "All I have to say is: Wow!" 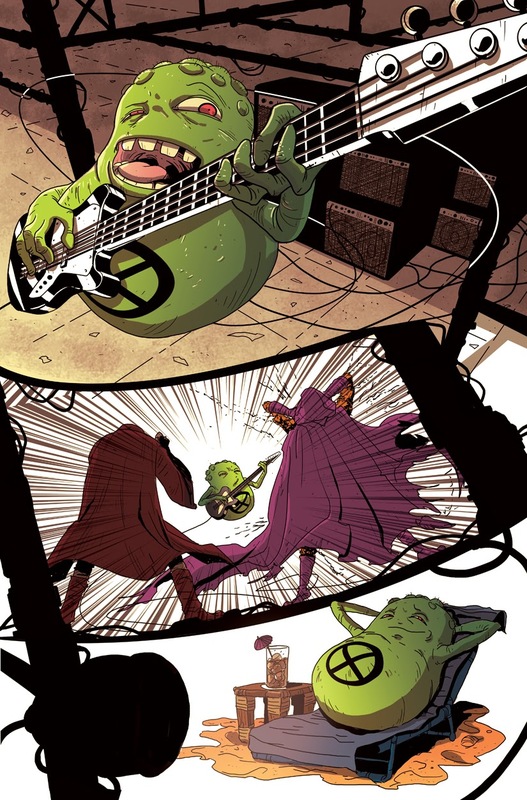 says co-writer/artist Art Baltazar. 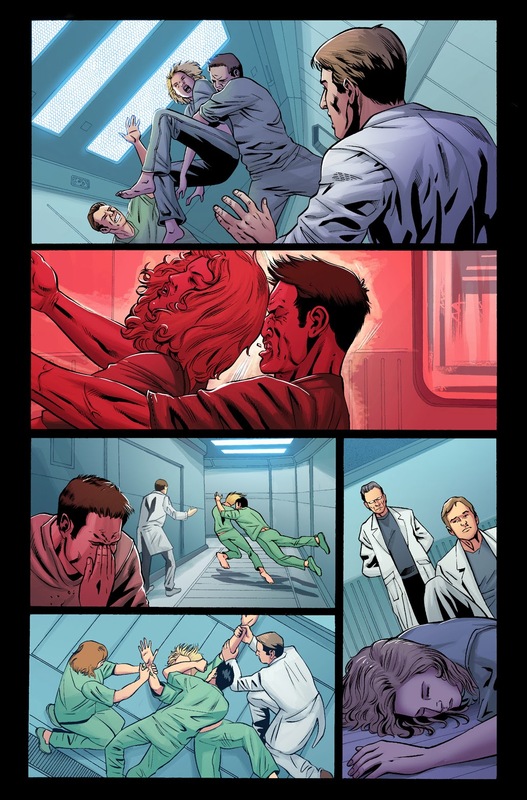 "I am amazed at the comics which we get to create sometimes! Captain Action action figures have been a classic American toy forever, and now that he is back, the world will be a better place! It's an honor to be working so close to this iconic character… even if our version is a cat. Aw yeah!" "I feel so lucky to be in this industry and that people are willing to let us play with their toys," adds co-writer Franco! 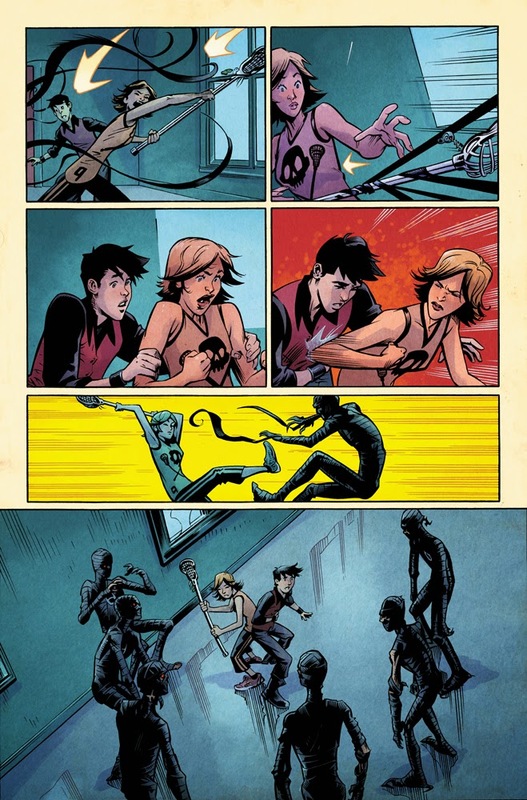 "This one means quite a bit to me personally because this crossover event features something we created -- Action Cat from our own Aw Yeah Comics -- which we get to crossover with Captain Action (as a cat) and the heroic crew from Dark Horse. 'Wow' is an understatement! Every year, I think we cannot top what we did before... and I am proven wrong, as this is one of the coolest things I've ever had the privilege to work on! Aw Yeah, Dynamite!" "I've gotta say, we've had some fun, high octane, cataclysmic, unbelievable crossovers through the years," states Dynamite CEO / Publisher Nick Barrucci. 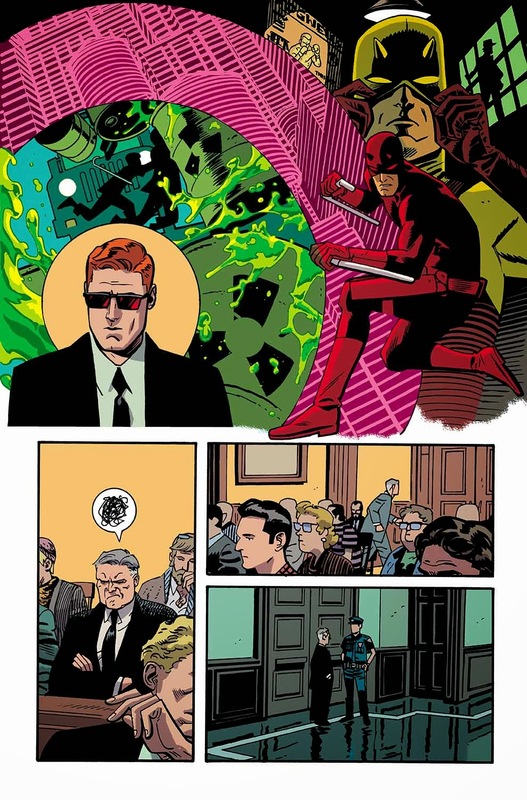 "But this crossover will be the most fun! What Art and Franco have put together is just incredible! 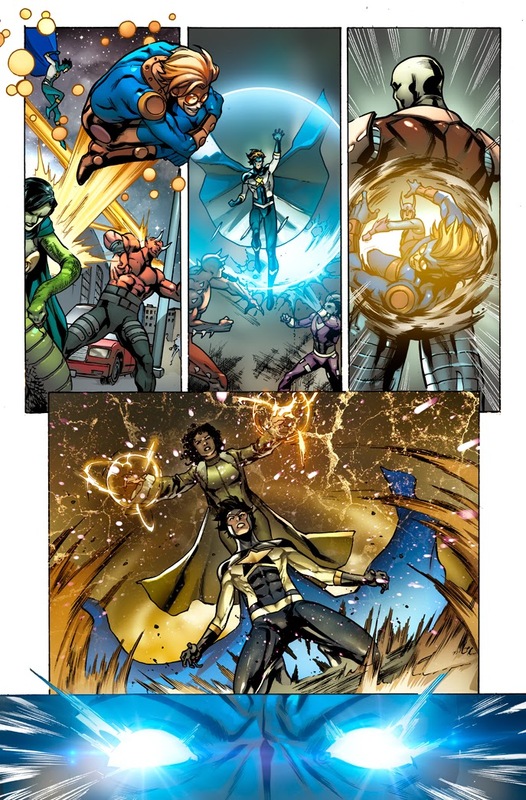 Bringing together the Aw Yeah universe, the Dark Horse universe, and the Dynamite universe -- this true trifecta is going to be epic. And did I mention fun? Aw Yeah!" Art and Franco have been having a blast with this "Itty Bitty" series. 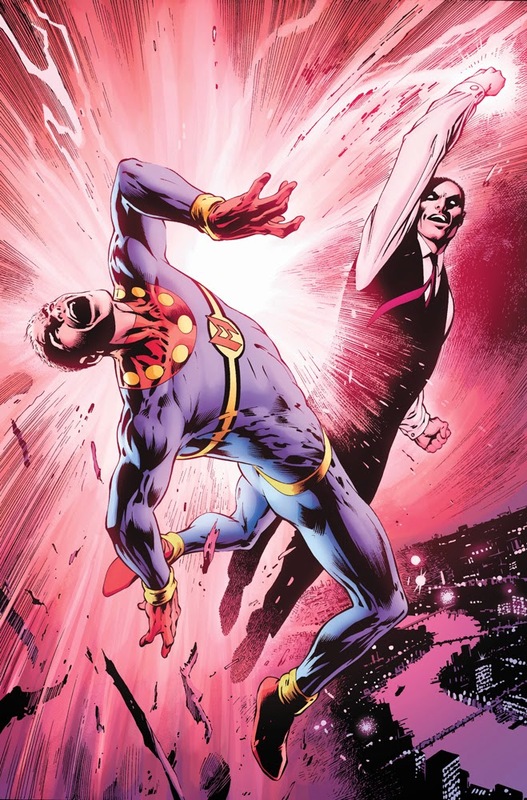 We loved their treatment of Hellboy and I'm particularly eager to see what mayhem they'll inflict on our superheroes." states Dark Horse President and Publisher Mike Richardson. 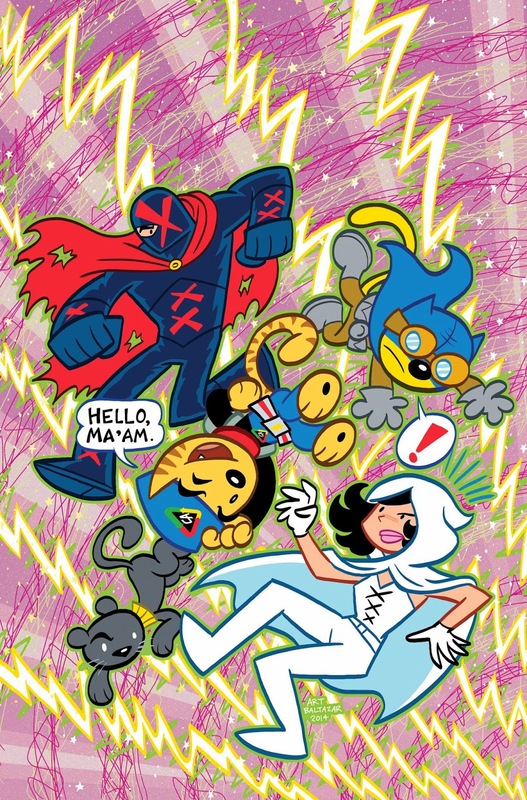 "Ghost and X teamed with Action Cat and Captain Action? Who would have thought?" 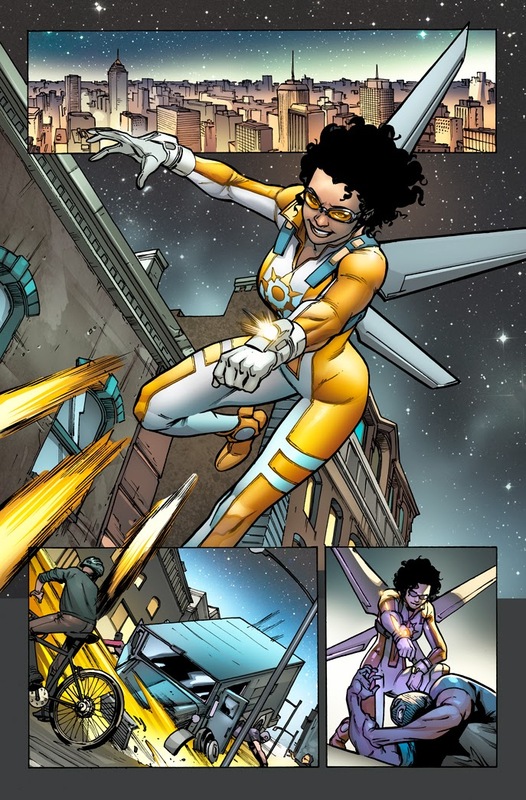 "Art and Franco bring a unique and infectious brand of fun to everything they do, and we're thrilled to have them focus on moreCaptain Action adventure with Dynamite in 2014," said Ed Catto, founding partner of Captain Action Enterprises. Dynamite and NBCUniversal Television Consumer Products proudly announces the upcoming Battlestar Galactica: Six comic book series, set within the continuity of the reimagined 2003 Battlestar Galacticatelevision series, produced by Universal Cable Productions and featuring one of its most iconic characters, the Cylon model known as Six. 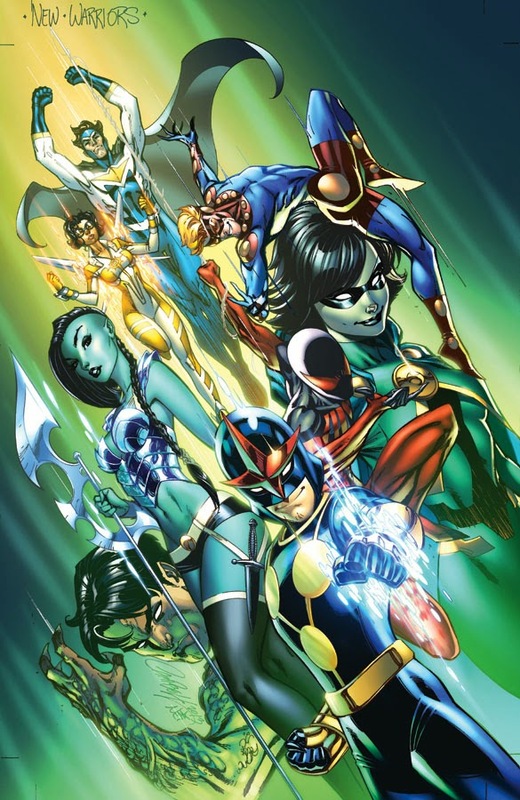 The first chapter of this five-issue miniseries will launch in April 2014, featuring the creative talents of writer J.T. Krul (Justice League, Fathom), interior artist Igor Vitorino, and cover artists Jenny Frison and Chris Bolson. 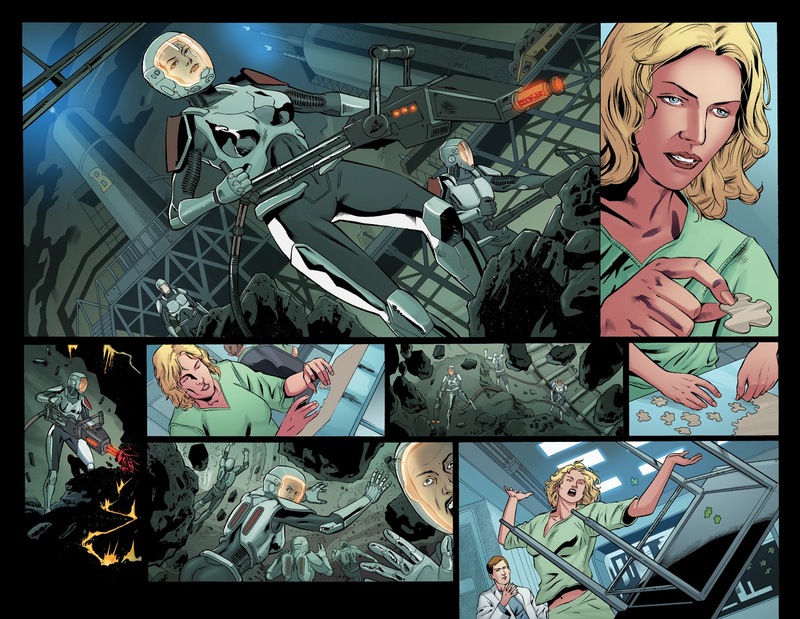 A photo cover featuring actress Tricia Helfer will also be available. 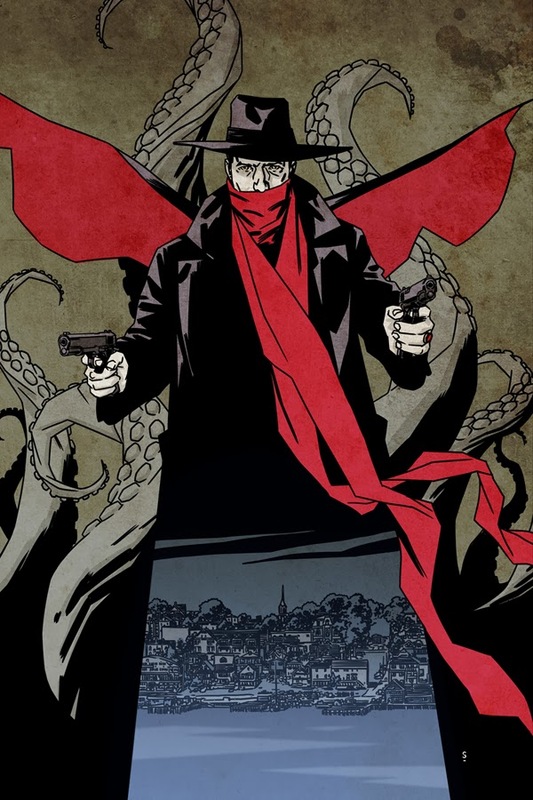 The Shadow series gets a special one-shot in April of 2014.The Shadow Over Innsmouth is written by Ron Marz (Green Lantern) and artist Matthew Dow Smith. 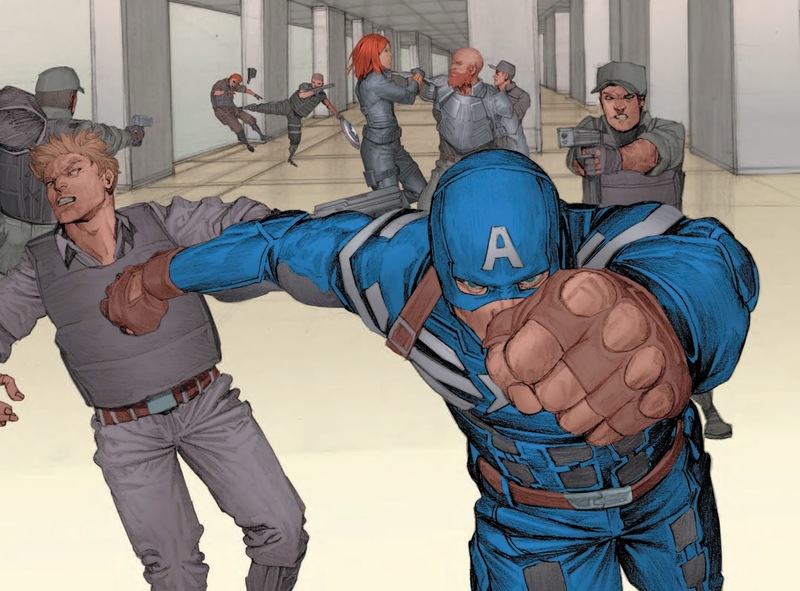 Crafting a Shadow story like no other and placing the pulp avenger in H.P. 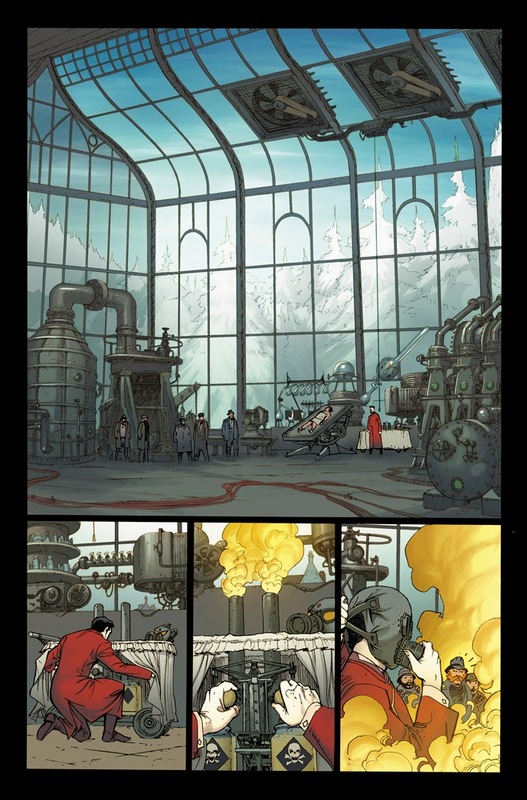 Lovecraft's famous setting for a truly inspired one-shot, this oversized issue will be available in April from Dynamite Entertainment via both comic stores and digital platforms. 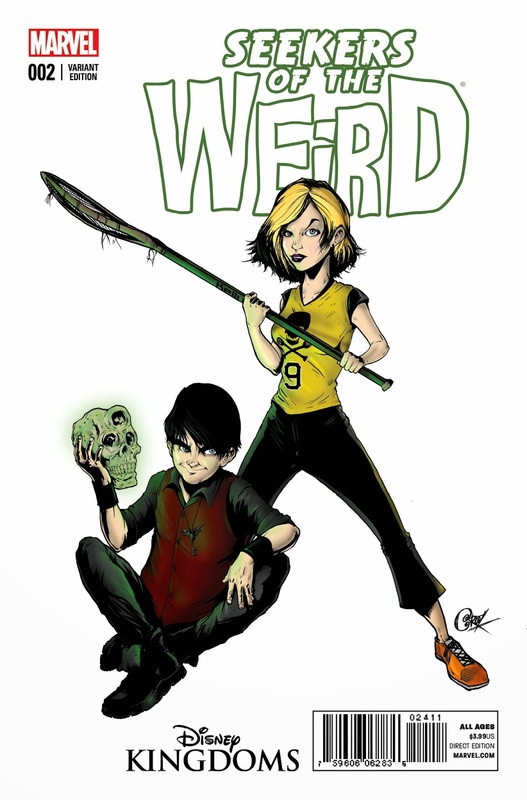 Weird #2, the next thrilling chapter from critically acclaimed creators Brandon Seifert and Karl Moline! Designed – but never built – the lost Disneyland attraction finally comes to life! Thanks to a National Endowment for the Humanities grant, the Detroit Historical Society will screen several films about the African-American experience in coming months to mark the 150th anniversary of the Emancipation Proclamation. The films, part of the “Created Equal: Amercia’s Civil Rights Struggle,” will air at the Detroit Historical Museum. Admission is free to Wayne County residents. “Slavery by Another Name,” at 1 p.m. March 8 and 9, focuses on unpaid labor by Southern black men in pre-World War II America and “Freedom Riders,” at 1 p.m. April 12 and 13, examines the stories of men and women who braved serious injury and death during the 1950s and ’60s. The series concludes with “The Loving Story,” at 1 p.m. May 10 and 11. It’s about a Virginia couple’s challenge of that state’s marriage laws in the late 1950s. All films include discussions after the screenings moderated by scholars or those who lived through the times shown in the movies. Visit detroithistorical.org to learn more.